Start the new year with a Tonne Run! Over the next 12 months we’re encouraging as many people as possible to join in the 12 month LIFE-CHANGING challenge of running 1000 miles (the width of Ethiopia) between now and the end of January 2013. While this sounds like a huge distance, when it’s broken down it equates to just three miles per day, six days per week throughout the year. Yes it certainly is a challenge but it is achievable! And what better motivation to keep going than to know that very needy children in Ethiopia will be the ones whose lives you’ll be changing with the sponsorship money you raise. 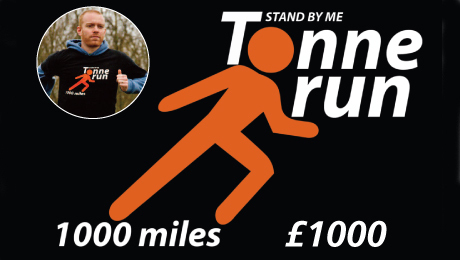 Register today for just £5 and you’ll receive a special information pack, a “Tonne Run” T shirt and sponsorship forms. If you feel you couldn’t manage it alone, then why not register as a relay team and combine your miles to reach the goal? Many children in Ethiopia have to walk over 1,000 miles each year to collect water for their families, and the more people who join us in the Tonne Run the more children we will be able to help. This year make your New Year’s resolution “to change the lives of children in Ethiopia”, and the Stand by Me Tonne Run will help you to keep it!